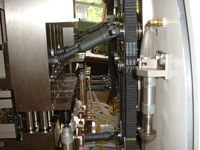 FM Machine Co. specializes in prototype machine building and in enhancing our customers pre-existing machinery designs by utilizing our knowledge of specialty materials, surface coatings, precision bearings and a variety of improvements that were not available at the time of the original design. Our ability to provide not only precision CNC machining and grinding, but also the diversity to weld, paint, build custom electrical panels, machine wiring, pneumatic and hydraulic installation gives our customer the peace of mind that their design remains secure and confidential. This also provides them with only one place to travel to for progress review and final testing. Customers can rely on FM Machine Co. to solve their most challenging machine building requirements.